The long fingers represent thinking and love of detail and the square palm shows practicality and someone down to earth. The lines are clear but finer than on the earth hand. The square shape of the palm gives practical, realistic and down to earth qualities and the long fingers show the thinking person. This shaped hand is rarely plump. The fingertips are often spatulate, depicting some obsessive qualities. The long fingers depict someone who is mentally active, logical, intelligent, patient with a love of detail. They like to think things through themselves. Also, tend to be inquisitive and eager to Hence, they make good students. They prefer to keep busy mentally with thoughts and ideas with constant variety and change. Communication and technology interest them and they are often up to date with the latest technology. Many have the talent in vocal or literary fields. A suitable career could be journalism, teaching or something involving intellectual activities because they become restless or bored without mental stimulation. (Do the career quiz here). The emotional side of their life may be difficult to experience; they feel comfortable talking about their feelings rather than showing them. Enjoying this content? Please help us stay active. All donation amounts are welcome. 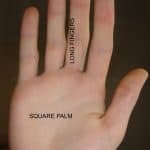 For more information about the hand and finger shapes, see Destiny palmistry Basics. More about it here.